Here are a few thoughts on Brexit. I now I am a couple of days late and the original deadline was the 29th, but it looks like the Unwanted Kingdom got an extension. It is irritating to hear English people go on and on about their “sovereignty”, when they ran an empire from an island they invaded. They never cared about anybody else’s sovereignty, so why should anyone care about theirs? Plus, let’s not forget, while in the EU, people in the Unwanted Kingdom still get to use their own currency and speak their own language. They got a lot of breaks from the EU. Not bad for them. On the other hand, when your quest for “sovereignty” is guided by Russia, how sovereign are you really? I say to the Brexiteers what I say to Republicans in the USA: The Russians are not doing this for you. Part of the problem is the Brexiteers have been lying from the beginning. They said the Unwanted Kingdom would be able to save millions of pounds a week and put it into the National Health Service. They later denied saying that. The were acting like bozos during the negotiations, telling the British public that “we are going to give them nothing that they want, and they are going to give us everything that we want, and they are going to like it.” That was the first year. Then the second year they all acted like those meanies in Brussels were kicking the UK out of the EU. The rot started from the very beginning, with David Cameron. He started the referendum to appease the UKIP. He was a Tory, so he should know that if you give a conservative an inch, they will act entitled to a mile. Plus, he initiated a referendum for a change that he did not want. The Scottish independence referendum failed, which put the Scottish nationalists in the position of not getting what they wanted, but not being any worse off. They pushed for a change that they wanted. Cameron got a change that he did not want. And then he promised to be bound by the results of the referendum, even though it was legally non-binding. Mistake number two. Another structural flaw is that it did not require a supermajority. Maybe a change this big should require a bigger percentage than 51.89%. All the Brexiteers keep going on about freedom, and democracy, and the will of the people, but this barely squeeked by. And just like the USA, rank and file conservative voters are going against their own self-interest, voting for rich conservatives who do not care about them at all. And if you are all sooooo concerned about globalism and sovereignty, maybe you should do something about the City Of London. Brexiteers are ranting about the globalists in the EU, but London is the real ground zero of globalism. Technically it is the City of London Corporation, but the phrase “City of London” does not refer to all of London. Just the onshore tax haven part. One could call it The Worshipful Company of Liars, Cheaters and Thieves. They do not care about rural England anymore than they care about rural anywhere else. Josh Marshall pointed out that some Brexit campaigners said that “[t]he world hungered for a strong Britain on the global stage.” Again, this is total delusion. Granted, a lot of speak their language, but not by choice. Nobody loves them, nobody respects them. Never did. Never will. If you want to go through life thinking you are special, you can do that, but nobody is obligated to agree with you or accommodate you. Another good article is at here on the antipope site. Big Jim does not like people who intentionally cause problems for other people. 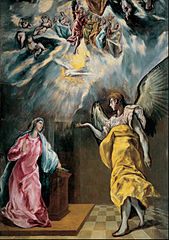 “The Annunciation”, El Greco (1541 – 7 April 1614), in a private collection, assumed allowed under Fair Use.